Hawaiian Spirulina is a blue-green microalgae, Arthrospira platenesis, which is grown naturally under the intense Hawaiian sun on the Big Island of Hawaii. It naturally contains protein, iron, beta carotene, minerals, vitamin B12, zeaxanthin, chlorophyll, and phycocyanin. One 3 gram serving has higher levels of some key antioxidants, enzymes, and minerals compared to 5 servings of fruits and vegetables. Ideal for vegans. · Nutrex Hawaii, founded in 1999, is the leading producer of natural microalgae supplements from Hawaii. Farm to Bottle, we control the cultivation, harvest and processing of our Hawaiian Spirulina and BioAstin Hawaiian Astaxanthin microalgae products. We are GMP (Good Manufacturing Practices) third-party certified. All of our products are pesticide and herbicide free, non-GMO, free of gluten, soy, lactose, and preservatives. BETTER THAN ORGANIC - Spirulina is grown in water. Because organic-labeled spirulina uses animal waste as fertilizer in the water, it's ONLY *grown* outside the USA, usually in China, resulting in high levels of contaminates & heavy metals, bad taste & smell, & is usually irradiated. Watch out for organic spirulina claiming it's *manufactured* in the USA - meaning bottled, not grown. Hawaiian *grown* spirulina uses vegan mined nitrates & no pesticides, herbicides, or GMO's, producing clean, high-quality spirulina. HIGHEST QUALITY & SAFETY - Because we grow and bottle our own product, you can be confident knowing where your spirulina comes from: a USA GMP certified facility with extensive quality control & lab testing of every batch. Vegan -Kosher - Halal - Gluten & Soy Free - No fillers, preservatives, or dyes - Farm to Bottle. SUPERIOR NUTRITION - Nourish your body with proteins, vitamins & minerals with this powerful superfood. 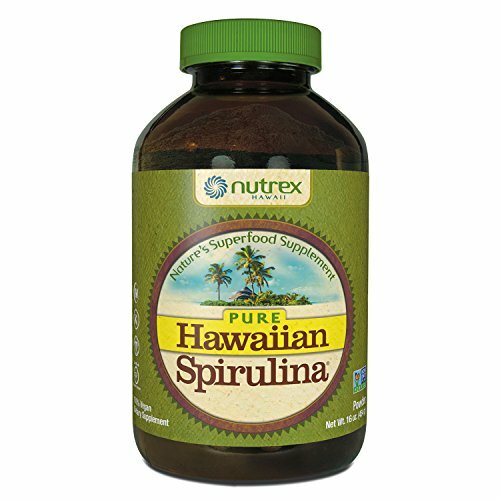 Hawaiian Spirulina is full of antioxidants, vitamins and minerals, and contains some of the highest levels of protein of any plant or animal source. Spirulina contains up to 70% digestible, complete protein, high levels of iron, beta carotene, and other healthful nutrients including B12, vitamin K, chlorophyll, and phycocyanin. BOOSTS ENERGY & IMMUNITY - Give your body what is craves. Have a hard time getting your daily servings of veggies? Support your diet with one 3g serving of Hawaiian Spirulina containing higher levels of some key antioxidants, enzymes, vitamins and minerals than 5 servings of fruits and vegetables. Gram per gram, Hawaiian Spirulina has 2800% more beta carotene than carrots and 280% more antioxidant potency than blueberries. NATURALLY GROWN IN THE USA - Hawaiian Spirulina is grown naturally in Kona, Hawaii, USA, since 1984. Our unique farm to bottle process ensures high quality products from a source you can trust.